The frame is the original one supplied by Criswick & Dolman (label recorded by Scharf), inscribed on the front in the centre: THE RT HON. 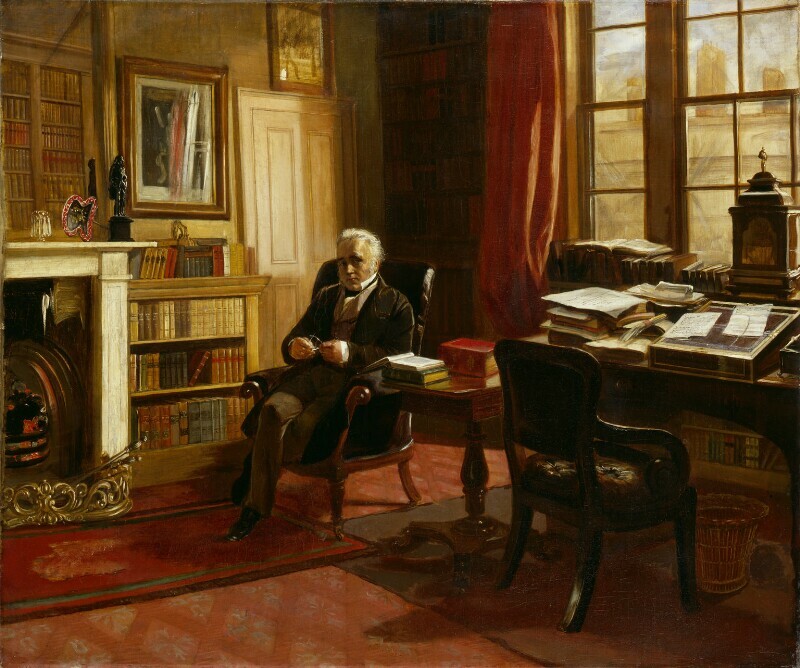 T. B. MACAULAY IN HIS STUDY./E. M. WARD, R.A. and on either side, in a later inscription: BOROUGH OF STRETFORD PURCHASED 1934. On the back of the frame is a label for Thomas Agnew & Sons. The original canvas was supplied by Roberson's (recorded by Scharf). Macaulay noted in his 'Journal' for 18 May 1853: 'Ward came at eleven. I had a long sitting. I am tired to death of these sittings. He did not go till three, and would not have gone then if I had not sent him away.' On 25 May he wrote again: 'He sate all day in the room ... [illegible: poisoning?] it with the smell of paint. At one I went out - came back at four and found him still there. He has made me uglier than a Daguerreotype. However he is a clever fellow.' In a note on the picture when it was exhibited in 1868, Scharf wrote that it was 'very much Macaulay's attitude' (Sir George Scharf's Sketch Books, LXXX, 78a). In his copy of Ward's sale catalogue, he called the portrait 'excellent', and wrote that it was 'The Room as I knew it'. In his biography of Macaulay, G. O. Trevelyan wrote of his chambers in the Albany (II, 97-8), that they 'were comfortably, though not very brightly, furnished. The ornaments were few but choice:- half a dozen fine Italian engravings from his favourite great masters; a handsome French clock, provided with a singularly melodious set of chimes, the gift of his friend and publisher, Mr Thomas Longman; and the well-known bronze statuettes of Voltaire and Rousseau … which had been presented to him by Lady Holland as a remembrance of her husband.' The illustration in the plate volume is taken from the 1868 SKM negative; the present block was made before the portrait entered the collection, when its location was still unknown. Comparison with the 1868 photograph reveals some insensitive restorations in the lower right hand part of the picture, especially on the carpet under the desk. The portrait of Macaulay is one of at least seven pictures of writers in their studies executed by Ward in the 1850s. The others include Thackeray (1854, destroyed), Bulwer Lytton (1851, Knebworth, plate 562), Stanhope (1854, Hughenden Manor), Dickens (untraced), Hallam (1858, untraced), and Forster (Victoria and Albert Museum). Apart from the portrait of Forster, all the others appeared in the artist's sale. They were evidently painted as a companion series which Ward may have hoped to exhibit together, with a view to selling and engraving them as a group. Portraits of literary figures were popular at the time, and Ward's pictures combine portraiture with a genre representation of the writer in his setting. Healthy complexion, brownish grey eyes, grey hair. Dressed in a white shirt, black stock, medium greyish waistcoat and trousers, dark grey coat and black shoes, holding a pair of library spectacles. Seated in a dark brown, polished leather armchair. Brown wooden pillar table beside him with red and green leather-bound books, the former either a copy of the Post Office Directory or Burke. Dark brown leather desk chair at right, a wicker waste-paper basket, and a wooden desk with a single drawer covered with a folding, wooden writing-case, bound in brass, books and papers. Bookcase behind with assorted books on the shelves, surmounted by a clock. View of greyish houses, brownish-red chimney pots and blue sky through window behind. Red curtain on the left of the window, and beyond another bookcase. Door behind Macaulay, and above a framed picture or design(?). Framed print to the left of the door, with white and red reflections in the glass, and a bookcase below. Further to the left a white marble fireplace with a large mirror above, and a glass ornament, a fan, and a black statuette of Voltaire on the mantelpiece. Below a coal fire in the grate, and a brass fender with two fire-irons resting on it. Red runner carpet in front of fireplace, on top of a paler red patterned carpet covering most of the floor. A grey drugget carpet covers the area below the desk, desk chair and pillar table. E. M. Ward Sale, Christie's, 29 March 1879 (lot 82), bought Agnew; Richard Hurst, his sale, Christie's, 25 April 1899 (lot 125), bought Agnew; presented to the Whitworth Art Gallery, Manchester, through R. D. Darbishire, 1899; purchased from the Whitworth by the Borough of Stret¬ford, 12 June 1934, and sold by them, Henry Spencer & Sons, Retford 14 May 1971 (lot 222) Bonham's, 1 July 1971 (lot 98), bought Abbott & Holder; purchased from Patrick Corbett, 1972.